This family-run guest house is a real jewel and is situated in a secluded location near to the Dalyan Delta in the Mediterranean region of South West Turkey. A frequent boat service takes guests across the river to the hotel thus preserving its tranquillity. Boats are readily available on the gently flowing Dalyan River and provide an opportunity to head downstream to Iztuzu turtle beach through the labyrinth of channels alongside the reed beds of the Dalyan Delta or upstream to the renowned Thermal Baths and Lake Köycegiz - or just to wander through Dalyan enjoying the cafe culture and the views across the river. This entire region is designated as an area of outstanding natural beauty and is a paradise for ramblers with endless treks winding along the river banks, through the reed beds and up into the surrounding pine covered slopes. The Hotel provides a complementary minibus and riverboat service for guests wishing to visit Dalyan Village. The 10 minute trip is scheduled at frequent intervals throughout the day. The ambiance of this hotel is well suited to the yoga classes. 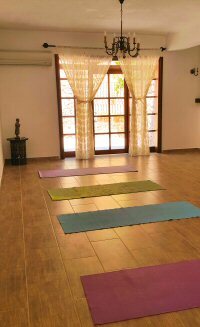 Morning yoga takes place in the indoor air-conditioned yoga shala. There will be two yoga classes a day, the first before breafast and a later afternoon class prior to dinner. Mid holiday there is one day with no yoga when you can go further afield on an excursion, take the famous 12 Islands Boat Trip or just relax by the pool. Accommodation is provided in comfortable en-suite rooms linked by the central tower. Rooms are large and have a small lounge area - see picture. The rooms overlook the lush landscaped gardens and swimming pool, with uninterrupted views of the surrounding unspoilt countryside. The tranquil swimming pool and surrounding area envelops guests with peace and quiet. Relax on the sunloungers and enjoy the sunshine. Food - Buffet breakfast and dinner are served in the Garden Restaurant. A varied and plentiful menu is offered, consisting of local dishes and traditional Turkish cuisine. A light a la carte lunchtime menu is also available. Ingredients are sourced daily and locally wherever possible and the dinner menu is supplemented by the daily harvest of home grown vegetables from the hotel vegetable garden. Not Included - Flights, insurance, transfers, treatments, lunch and snacks, all bottled water, teas and coffee. Flights - There are both chartered and scheduled flights to Dalaman airport, Free Spirit are very happy to help you search the internet for flights. It is usually cheaper to book your flight as early as possible - the price generally increases as the plane fills. Transfers - Your transfer can be organised for you. The transfer is 20 minutes by taxi to the river. From here you will be ferried across and taken the short remainder of the journey by the hotel car, to the hotel. Total journey time is about 40 minutes. The holiday was brilliantly organised. The hotel and staff were brilliant. Food was good and ample! Even though it was very hot I had no problem with that. Air conditioning in bedroom was excellent. Down to the yoga. Marnie had planned every session with great care and delivered the sessions in a balanced and professional manner, providing options to suit all. It was my first time on a yoga retreat and I will certainly go again, particularly with Marnie. My ashtanga teacher commented on my increased flexibility. As a group we agreed excursions. Marnie organised these trips all of which I thoroughly enjoyed. Marnie must be complemented on the care and detailed planning of everything for the entire week. Sultan Palas yoga retreat was an exceptionally wonderful experience,of which the memory of will stay with me for a very long time. Marnie Sullivan's yoga sessions were carried out in a lovelycalm and caring atmosphere and, for me spiritually uplifting. Sultan Palas is in a beautiful area of Dalyan. The hotel is set in lovely, tranquil gardens with lots of private areas to relax in. Owners and staff were so pleasant and very helpful; food very tasty and plentiful. In fact everything was just all I could wish for. A super holiday. Thank you Free Spirit Travel and a huge thank you to Marnie for all her care and attention. I would just like to give you some feed about sultan palace and the yoga with Marnie Sullivan. The hotel was excellant. Marnie was without fault one of the best teachers I have had in my 23 yrs of doing yoga. She was not only a first class teacher but acted as a personal guide. Taking us all on many places of interest. Without doubt one of the best holidays I have had. Just wanted to write and say what a fabulous week I've had with Kathryn at Sultans Palas, Dalyan from 15th May. Kathryn's style of teaching is just lovely! She's warm, funny and very knowledgable - the sessions combined yoga, tai chi and pilates. I came home feeling so fit and we had a ball - some days just laughed our heads off! So maybe you should also advertise that she does 'laughter yoga'. I know that people might be worried about travelling to Turkey just now, but this venue is really stunning and as calm as ever. I always felt safe, even outside of the venue and the staff and people generally are as welcoming as ever. We just wanted to say thank you so much for the lovely holiday we had at the Sultan Palas Hotel in Dalyan recently. 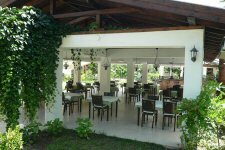 It really is a special place; the rooms very clean and comfortable, the beautiful pool and gardens, the friendly, helpful and discreet staff and the fresh food including wonderful mezes. As friends of Lorna's we knew the yoga would be brilliant and it was so lovely do do it in such tranquil surroundings. Just had to give you some feedback and please feel free to post this on your site .... my sister and I had the most fantastic week doing yoga with Niamh. She is so warm hearted and her teaching is great. We had an amazing time; connecting with a small group of women - doing yoga, swimming, sunbathing and laughing together an awful lot! Friendships made that we think will be maintained. Oh and the venue was beautiful too. A real gem - the gardens and pool at Sultans Palas make it just perfect. Just a quick note to say how much I enjoyed my trip to Dalyan! The hotel was a little paradise and the staff were lovely, very friendly and helpful. And the yoga sessions with Edith were wonderfully relaxing, just what I needed!